I’m in love with this dish right now! 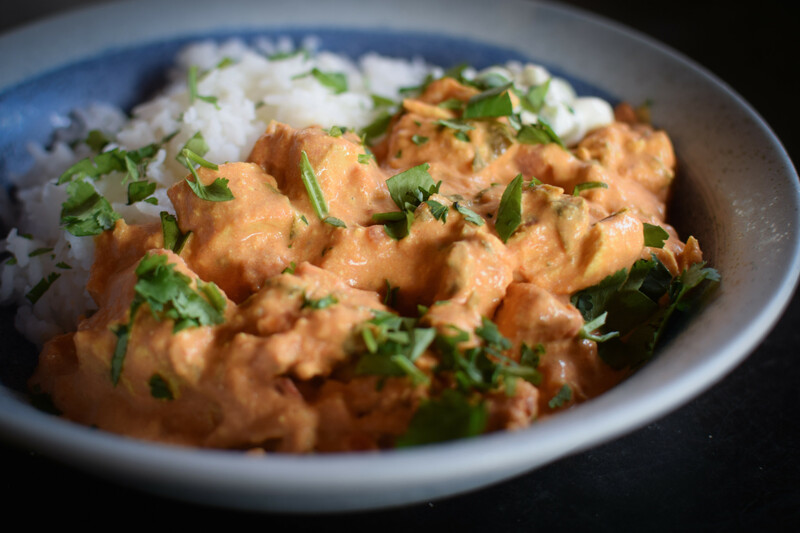 I have made it twice this month, and I already can’t wait to make it again 🙂 It’s spicy, creamy, tangy, and sweet…all at the same time. I can’t explain it well, but it’s DELICIOUS, you have to take my word for it! I love to eat it with Raita, a yogurt sauce, and some basmati rice. We serve a simple green salad with a lemon/olive oil dressing on the side. Use a fork to prick the chicken breasts all over on both sides. Cut the chicken breasts lengthwise, so you have 2 thin slices of chicken breast instead of 1. Combine garlic, ginger, turmeric, garam masala, coriander, and cumin in a small bowl. Wrap half of this mixture and refrigerate. In another bowl, place half of the spice mixture, and add yogurt, salt, and mix well. Add chicken to the yogurt mixture, coat well, and refrigerate for 4-6 hours. Heat ghee in a large heavy pot over medium heat. Add onion, tomato paste, cardamom, and cayenne and cook, stirring often, until tomato paste has darkened and onion is light brown and caramelized, about 5 minutes. Add remaining half of the spice mixture and cook, stirring often, until bottom of pot begins to brown, about 4 minutes. Add tomatoes with juices, the water, and heavy cream. Bring to a boil, reduce heat, and simmer, stirring often and scraping up browned bits from bottom of pot, until sauce thickens, about 20 minutes. Meanwhile, preheat broiler. Line a rimmed baking sheet with foil, set a wire rack inside sheet, and oil the rack. Arrange the marinated chicken on the rack in a single layer. Broil until chicken starts to blacken in spots, about 10 minutes. Cut chicken into bite-size pieces, add to sauce, and simmer, stirring occasionally, until chicken is cooked, about 10 minutes. Transfer the curry to a serving dish, and sprinkle with cilantro. 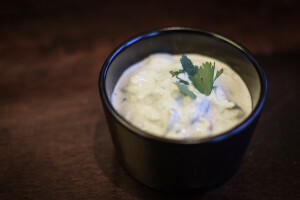 Serve with rice or Naan, and raita (recipe follows). Do-ahead: You can make the sauce up to 3 days ahead and keep in the fridge in an airtight container. Wrap and chill in the refrigerator until ready to serve.